Originally Barcodes were 1D representation of data using width and spacing of bars. Common bar code types are UPC barcodes which are seen on product packages. There are 2D barcodes as well (they are still called Barcodes even though they don’t use bars). 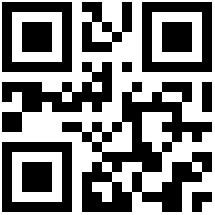 A common example of 2D bar code is QR code (shown on right) which is commonly used by mobile phone apps. You can read history and more info about Barcodes on Wikipedia. There is an open source Java library called ‘zxing’ (Zebra Crossing) which can read and write many differently types of bar codes formats. I tested zxing and it was able to read a barcode embedded in the middle of a 100 dpi grayscale busy text document! This article demonstrates how to use zxing to read and write bar codes from a Java program. It would be nice if the jars where hosted in a maven repo somewhere, but there is no plan to do that (see Issue 88). Since I could not find the binaries available for download, I decided to download the source code and build the binaries, which was actually quite easy. The source code of the library is available on Google Code. At the time of writing, 1.6 is the latest version of zxing. 1. Download the release file ZXing-1.6.zip (which contains of mostly source files) from here. This will install the jar in your local maven repo. Though not required, you can also deploy it to your company’s private repo by using mvn:deploy or by manually uploading it to your maven repository. There is an ant script to build the jar as well. If you are using ant, add the core.jar and javase.jar to your project’s classpath. If you are using maven, add the following to your pom.xml. Once you have the jars included in your project’s classpath, you are now ready to read and write barcodes from java! You can read the bar code by first loading the image as an input stream and then calling this utility method. String imageFormat = "png"; // could be "gif", "tiff", "jpeg"
In the above example, the bar code for “97802017507991″ is written to the file “qrcode_97802017507991.png” (click to see the output). The Javadocs are part of the downloaded zip file. You can find a list of supported bar code formats in the Javadocs. Open the following file to see the javadocs.